Arya likes reading books about Spot, but she particularly enjoys Spot books with a lift-the-flap feature. Although Spot’s Hide and Seek by Eric Hill doesn’t have any flaps, my baby enjoyed looking at the large, colorful pictures of Spot and his friends. The colorful front cover gives a good preview of the rest of the book as a cute dog covers his eyes while a blue hippo tries to hide behind a bush. While Arya still liked Spot’s Hide and Seek, I was quite disappointed at the lack of flaps. Since the entire Spot series is best known for the lift-the-flaps feature, it seems ridiculous that a book about hide and seek doesn’t use flaps to hide and reveal Spot’s friends. Spot’s Hide and Seek tells the story of Spot playing hide and seek with his friends. Spot closes his eyes and counts to ten as his three friends run off and hide. As Spot looks for his friends he hears giggles and finds them all one at a time. 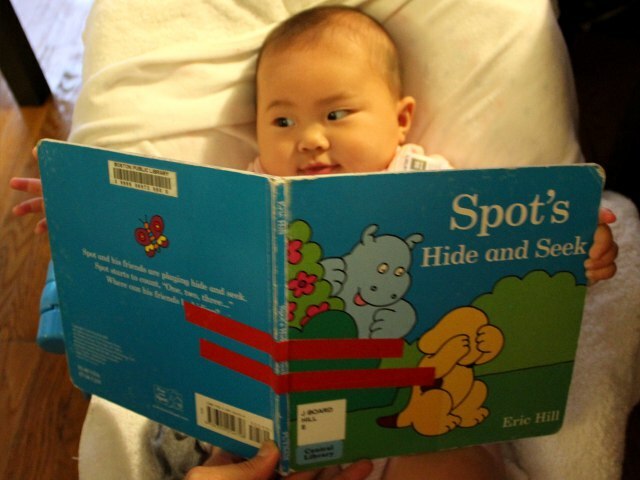 With as many as twenty words per page, Spot’s Hide and Seek is much longer than other Spot books targeted at babies. Simple, monosyllabic vocabulary keep the book easy to understand for early readers. Nonetheless the book is not designed for children to read by themselves. Complex sentence structure and the use of extensive quotations from different characters make it difficult for young ones to completely follow the story without assistance from adults. Even without flaps the pictures attract the attention of even young babies. Spot and his animal friends are large and recognizable while colorful backgrounds add visual contrast to every page. Unfortunately I still couldn’t help thinking how much better the book would have been had it used flaps to hide all of the animals. Spot’s Hide and Seek is useful for teaching the basic concept of the game of hide and seek. Older children who love playing hide and seek will also enjoy reading the book. Any fans of Spot will also like the big pictures of Spot and his favorite friends. Spot’s Hide and Seek costs (including shipping) under $6 new and under $4 used from Amazon.